Xerox Printer drivers are mainly installed on the computer to simplify the use of a printer with a computer. Managing and using your printer from your PC will be easy if you download and install the Xerox printer drivers by properly knowing how to install Xerox printer driver on windows 10. You can download it from any one of the trusted websites. Wait till the entire installation process gets over and then managing your printer will be very easy. Connect your printer to the computer during installation. You can install any one of the drivers from the three based on your requirement. Check if you have logged in as an administrator to give the required permissions before beginning the installation process. Place the downloaded driver files in an easily accessible location. Verify if you have downloaded the correct driver. Add your printer to the list in the initial stage of the installation procedure. Make use of the TCP/IP address or the hostname to add your printer. Browse to the location where the Xerox printer files are saved. Select the printer model and enter a name for the printer. Choose to either share your printer or not in the next window. Step 1: Before initializing the process of how to install Xerox printer driver on windows 10, check if you have logged on to your computer as the administrator. In doing so, you can delegate the necessary permissions when required. Step 2: The Xerox printer driver file that is downloaded should be placed or saved in a location that is easily accessible. Finding the driver file should not take so much time. Step 3: There are three different types of printers to choose from namely Xerox Class, Xerox V4, and the Xerox V3 Drivers. Each type of driver has its own advantages. Choose one according to your need and download it. Step 4: Turn on your system and click the Windows button present on the Desktop. Select the Control Panel to open it. Click the Devices and Printers option. In case it is not listed, then go to the search bar and type Printers. In the next screen, select the Add a Printer option. Step 5: Next, choose the Add a Printer using a TCP/IP Address or Hostname option to add using any one of them. Under Device Type, tap the TCP/IP Device option to continue the work of how to install Xerox printer driver on windows 10. Step 6: Specify the Hostname or the IP Address in the Type a Printer Hostname or IP Address window. The Port Name now mirrors the IP address or the Hostname. If you want, you can modify the Port Name. Step 7: If installing a class driver, then select the Class Driver option and wait till the installation is over. V3 drivers offer full functionality when printing from a computer, but provides limited functionality when printing from the modem. In the case where you are installing a V3 or V4 driver, choose the Have Disk….option. Class Drivers offers only limited functions. If you want to run a Desktop app and the Xerox Print Experience app, then you should install the V4 drivers. Step 8: Navigate to the location where you have saved the driver file. Select the driver file and click OK. Step 9: Select a Printer Model of your choice in the Install the Printer Driver window. In the Type a Printer a Printer Name screen, enter a name for the printer. You can even make use of an existing name. Step 10: In the Printer Sharing window, choose if you want to share the printer or not. Click the Next option. Tap the Finish button and the Xerox printer driver will be installed successfully. 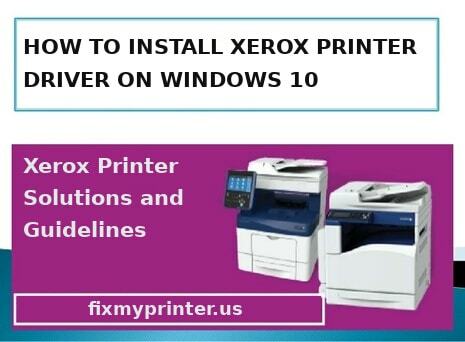 If not follow the above steps for the process of how to install Xerox printer driver on windows 10.